There are several reasons you may be looking for a roommate. Perhaps you’re a single active duty service member with orders, and you want to save some money on rent. Maybe your family is settled and you’ve decided it’s best to geobachelor/bachelorette--or let someone who is stay with you. Or maybe you’re the spouse of a service member and while they are deployed, you want to cut your monthly expenses down and open your home up to a roommate. Whatever the reason, you’ve decided that having a roommate is a great option for you and your family. However, having the wrong roommate can be a huge mistake. That’s why it’s important you choose the right person to live with. 1) Understand what it means to have a roommate. If you haven’t lived with a roommate for awhile, it’s possible you’ve forgotten what it’s like. Roommates can help cover the cost of your rent or mortgage, keep you company, make great study buddies, or provide security while your spouse is away. However, they can also invade your personal space, have a different schedule, and be quirky. They’re different from you and likely live differently than you. For example, I’m a clean, organized person. I like things put away where they belong. If someone takes something out and doesn’t return it to where they got it from, I’m going to have a problem. On the other side, I am so neat and tidy that a relaxed person who likes their home to look, let’s say lived in, would soon resent me--and the feeling would be mutual. 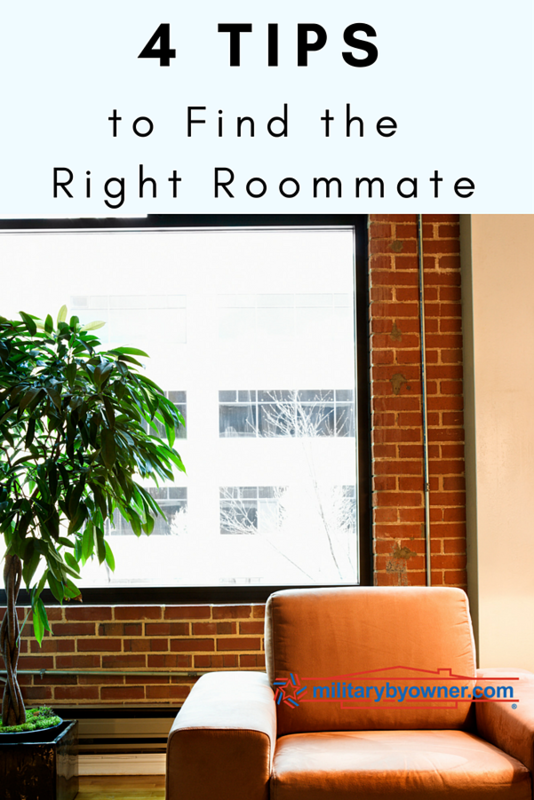 Neither way of living is good or bad necessarily, but understanding potential conflicts like this will help ensure that you look for qualities in a roommate that are compatible with yours. 2) Find someone in a similar situation. Are you a service member with short term orders for training? Search for a roommate who has the same orders. A lot of our single friends in flight school chose to room together. They were all there for the same reason, same amount of time, and wanted to live in the same area. It made far more sense to get one place together and split the living expenses than it did for them to each have their own apartment in the same complex. Are you a military spouse whose service member is deploying? Find another military spouse, but make sure you’re at the same point in life--with or without kids. Have you chosen to geobachelor/bachelorette? Find another service member who is doing the same. You may both be thankful to reduce the extra living expenses. Instead of turning to Craigslist to find a suitable roommate, check your pool of friends first. Friends already have your trust, and you’ll feel more relaxed than letting a stranger in the door--even if they’re the friendliest stranger you’ve met. Think you don’t have much to lose? At the very least, think about your issued gear and what would happen should it go missing. Looking within your group of friends can also broaden your roommate options. Think about friends back home or from college who have no military affiliation but could also use a roommate. Maybe they found a job in your area and you can spare the extra space in your home for them. This mutually beneficial living situation could never happen if you don’t look beyond your neighbors. 4) Set an end date. You can make it through anything when you know the end is coming. Hopefully, your time with a roommate is perfect, but if it’s not, it’s much easier to make something work when you know how long it needs to work. An open ended date will expand frustrations you already have and make it much more difficult to tolerate. Whatever your situation, if you decide that having a roommate is the best thing for you right now, be sure to choose someone who’s well suited for you. As you begin your search, keep these four tips in mind to help you find a roommate.